"What is this, uh, cheer-leading tryouts?" Suicide Squad is a DC Comics movie from Warner Bros, written and directed by David Ayer (End of Watch, Sabotage, Fury), and is based on the comic books. 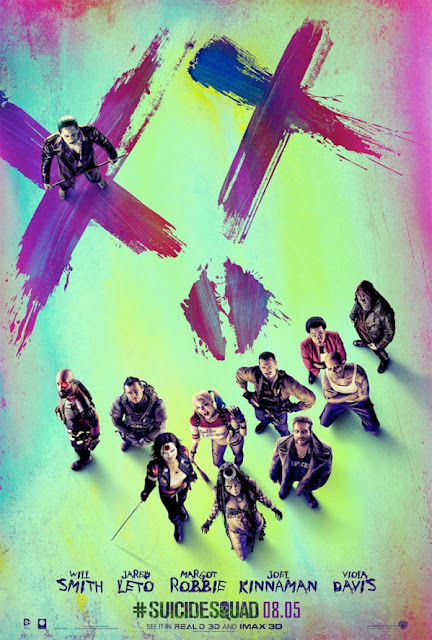 Will Smith is Deadshot, Joel Kinnaman is Rick Flagg, Margot Robbie is Harley Quinn, Jared Leto is Joker, Jai Courtney plays Boomerang, Viola Davis plays Amanda Waller, Cara Delevingne is Enchantress (my current fav. super model), and Adewale Akinnuoye-Agbaje is supposedly playing Killer Croc. All of these characters are part of a super villain team recruited by the government for secret missions. There are also claims that Ike Barinholtz is playing Dr. Hugo Strange, Adam Beach is possibly Ravan and Jim Parrack is playing Deathstroke. We shall see soon enough. This movie hits theaters on August 5, 2016. You don't want to miss it. I am pro Margot Robbie.